A conventional mortgage refers to a loan that is not insured or guaranteed by the federal government. The minimum down payment for a home purchase is 3% of the sales price. Previously, the minimum down payment for conventional loans was 5%, however it was announced December 8, 2014 that both Fannie Mae and Freddie Mac will allow for a 3% down payment. This will allow for borrowers with limited down payment funds potential access to both conventional and FHA options for purchasing a home. Compare that to many other lenders that require a 660 FICO score. Because of this, we can get more people qualified. Unlike FHA, a conventional loan does not charge you upfront mortgage insurance and if you borrow over 80% of your value, your mortgage insurance can be removed once your balance gets down to 78% loan to value. Conventional financing can be used for primary residences, second homes, and investment properties. Conventional loans are ideal for borrowers with good credit and either have equity or can put down a minimum of 3% on a purchase. 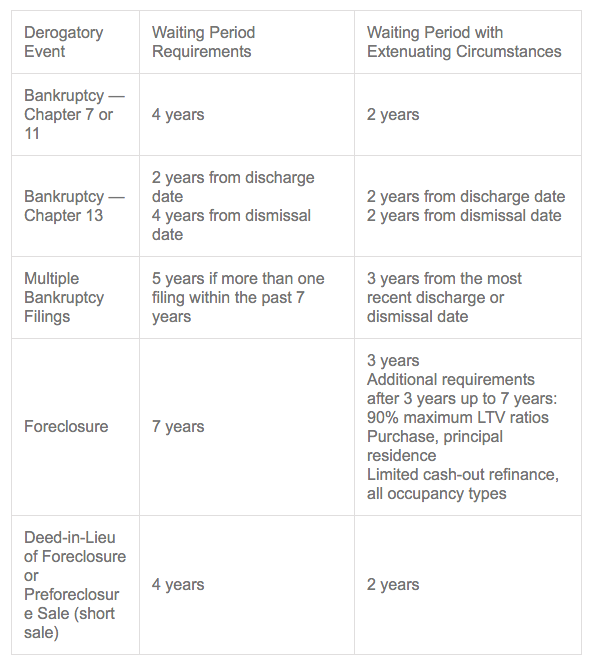 If you’ve had past credit issues such as bankruptcy or a foreclosure, the minimum waiting periods to qualify for a conventional loan are listed below. In certain cases, if there was an extenuating circumstance which caused the derogatory event (illness, loss of income, etc.) the waiting periods have been shortened. For reference, Short sales fall under “pre-foreclosures”. Want more information on Conventional loans? Contact us today to receive more information. We will contact you within 24 hours to review your options. Click here to complete a secure application.